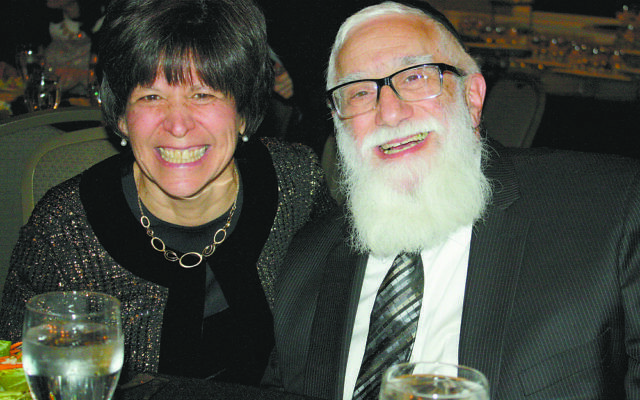 About 400 people attended Congregation Beth Jacob’s dinner of honor for Rabbi Daniel and Bluma Estreicher on Sunday, Feb. 28. Rabbi Ilan Feldman congratulates Rabbi Daniel Estreicher after presenting him a challah board as part of the community’s gift. Dr. Yosef (Kevin) Rodbell, Class of 1993, talked about the Estreichers’ memorable Friday night onegs, which he compared to a Norman Rockwell painting. Josh Joel, Class of 2002, shared what it meant to him when Rabbi E, recovering from knee surgery, traveled out of town and danced at his wedding. Jesse Cann, Class of 2016, presented his rebbe with a huge box of cookies for his after-school Torah learning sessions. 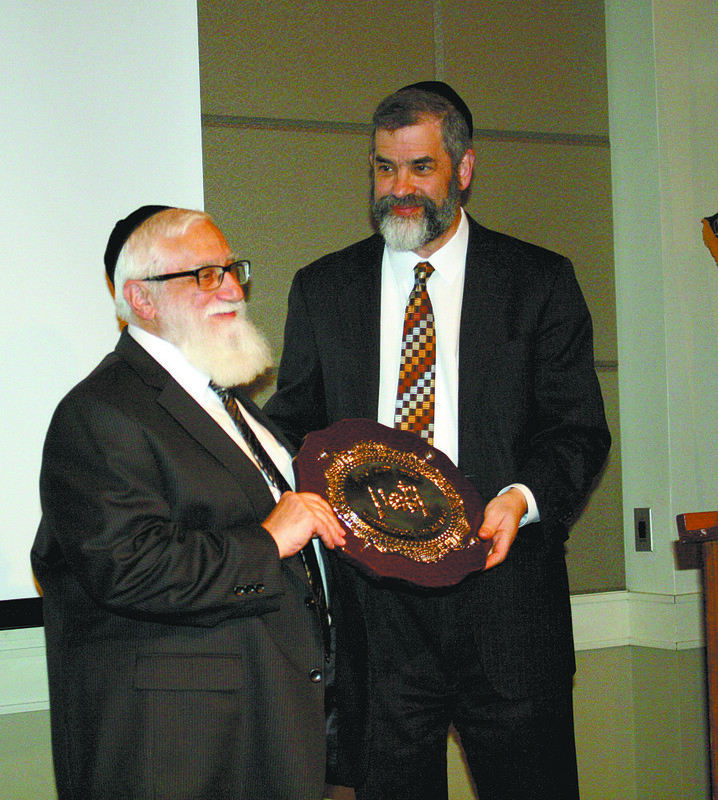 Representing the Estreicher children, Rabbi Naphtali Estreicher asked, “What motivates our parents?” He answered by referring to the Jewish ancestors, starting with Abraham and Sarah, who were devoted to spreading the word of G-d. 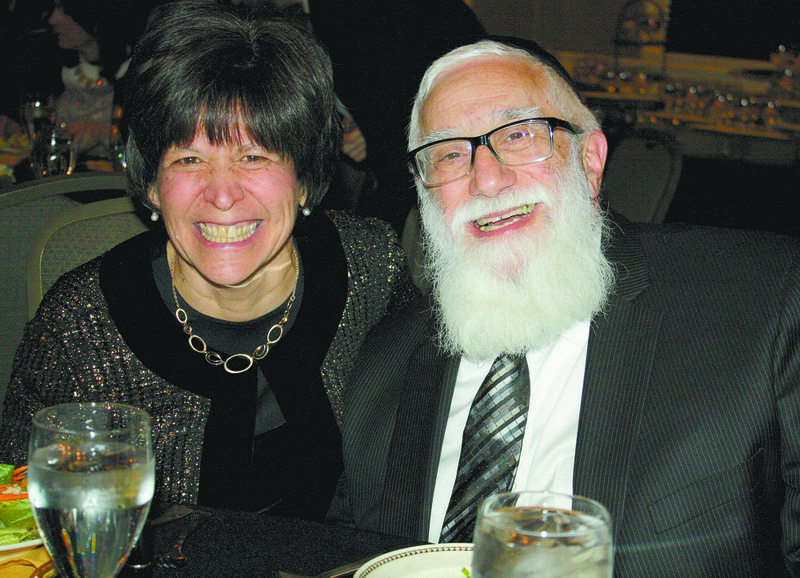 In his response to the evening, Rabbi E said, “We’re overwhelmed.” When he recognized his wife by saying, “I could never do this without my soulmate,” the standing ovation lasted several minutes while Bluma sat smiling. One of the most important messages of the evening came when Rabbi Estreicher shared his view of raising children. “Never give up,” he said. “We must love our children for who they are” and find ways to give them what they need. “Never does the Torah say, ‘Give up and disregard the child,’ ” he said. At the end of his speech, he praised Beth Jacob for its role in the community, adding his well-known, humorous insights at Gematria (Jewish number mysticism). Rabbi Akiva Gross started the Birkat Hamazon (the blessing after the meal), then handed the microphone to Rabbi E, his father-in-law. As everyone joined in the singing of the last stanzas, followed by the Yeshiva Atlanta Lions fight song, it was almost like being a student sitting around the Estreichers’ Shabbat table, receiving a kiss from heaven.